The Gymax Cardio Folding Exercise Electric Motorized Treadmill New Model is the succeeding model of the Gymax Cardio Folding Exercise Treadmill Classic Model. It has improved features over the classic model and as a result, it’s more expensive. 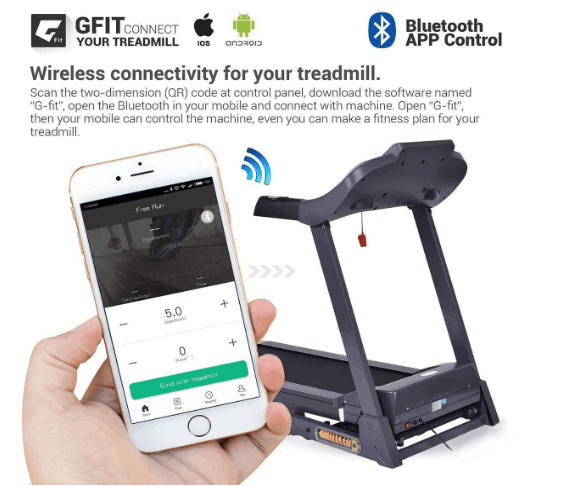 The major difference between the two models is that the new model is Bluetooth enabled and the user can connect the treadmill with a smartphone via downloadable G-Fit app. This app allows the user to make a fitness plan according to one’s height, weight, and heart record. It can automatically generate a training plan and reminds the user it’s time to exercise. Moreover, it is designed to allow the user to set personal training plan. The app is basically the user’s personal trainer, and it can record running history, get health report and ultimately helps to reach fitness goals. The Gymax Cardio Folding Exercise Electric Motorized Treadmill New Model is slightly bigger than the classic model but it can only conveniently allow the user to perform walking, jogging or light running exercises due to the size of the running surface and the motor capacity. It features a 2.5 HP motor that provides 0.5-9 mph speed and the running belt is made of rubber. There are 12 programs to select from and designed to help a user to achieve fitness goals. The deck is built to support 220 pounds/99.7 kg user maximum weight capacity. The base stabilizer arms equipped with a shock-absorbing system that protect the knees and the ankles from excessive stress. They also help to reduce noise as well during a workout. The big and multi-function backlit LCD monitor keeps track of gains and losses of the user’s workout effort. The user should be able to observe workout data such as time, distance, speed, calories burned, incline and heart rate. Yes, the new model features an automatic incline that could be adjusted from 0-15% for more intense workout experience that burn a lot more calories and improves overall physical well being. Click right here to have a peek at the discounted price of the Gymax Cardio Folding Exercise Electric Motorized Treadmill New Model on Amazon. 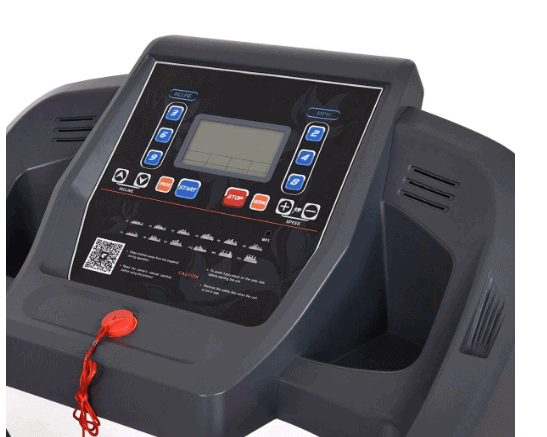 The Gymax Cardio Folding Exercise Electric Motorized Treadmill New Model is made of steel and supports 220 pounds/99.7 kg maximum user weight capacity and weighs about 132 pounds/59.8 kg. The treadmill’s overall assembled dimensions are 63 inches long by 28.7 inches wide by 52.7 inches tall. In other words, it will require a workout space with dimensions of 5’3’’ long by 2’4’’ wide and a ceiling height of at least 7’ high. It is portable and has a space-saving design that makes storage easy and convenient. The folding mechanism and the soft drop system allow you to fold and unfold the treadmill easily for storage while the integrated transport wheels facilitate the relocation of it. The folded dimensions are 42 inches long by 28.7 inches wide by 52.7 inches tall. The running surface is a little bit larger than that of the classic model, but still not enough space for taller users to perform a serious running exercise even if the motor can support that. The tread belt/running surface dimensions are 16.5 inches wide by 50 inches long. There is an oiling system on the right side of the deck that allows the lubrication of the tread belt. This could be seen as one of the best treadmills by users whose goals are to perform walking, jogging, and light running workouts. The Gymax Cardio Folding Exercise Electric Motorized Treadmill New Model is equipped with a powerful 2.5 HP motor that supports interval, speed, or endurance training. Its operation is smooth, quiet and does not vibrate. Therefore, a user can watch a video or a TV show without having to raise the volume high. The family members and the neighbors won’t feel disturbed either. The motor requires a US standard power source in order to be functional and provides 0.5-9 mph speed. The speed can be increased or decreased via the Quick speed buttons of 2, 4, 8 mph or can gradually do so by 0.5 mph using the +/- speed buttons. The console on the Gymax Cardio Folding Exercise Electric Motorized Treadmill New Model is rich with several features such as the Quick incline buttons, speed buttons, MP3 port, speakers, programs button, Mode button, start/stop buttons, safety key, phone holder, water bottle/item holders and a backlit LCD monitor. The console also has extended handrails that feature the heart rate sensors. When gripped during a workout the heart rate data will be transmitted and be displayed on the monitor. This simply enables the user to keep an eye on the heart rate data so that the target heart rate zone can be maintained. The monitor displays the metrics with high and quality readability that won’t be compromised even when viewed in a room that not well lit because it is backlit. As aforementioned, the monitor displays workout data that keep you inspired, such as time, distance, speed, calories burned, incline, and heart rate. The Gymax Cardio Folding Exercise Electric Motorized Treadmill New Model has an automatic incline of 0-15%. This means that the incline can only be controlled via the incline buttons on the console. There are Quick incline buttons for 3%, 6%, and 9% and there are two gradual incremental buttons that allow you to increase or decrease the incline by 1%. The incline basically helps the user to increase the amount of calories burned, muscles toned and builds greater endurance. The storage of the Gymax Treadmill New Model is made easy by the integrated transport wheels and its space-saving design. It takes less space when folded up. Storage space of 3’5’’ long by 2’4’’ wide by 4’4’’ high will be required for this treadmill. 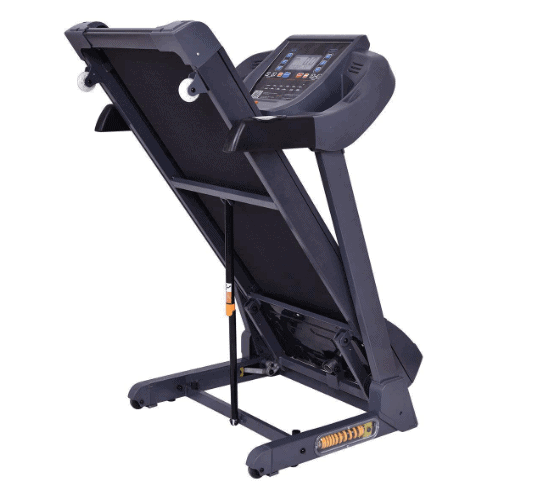 The Gymax Cardio Folding Exercise Electric Motorized Treadmill New Model has a built-in tablet holder and two water bottle holders. You can conveniently place your smartphone on this tablet holder as you connect to the G-Fit app, watch a movie or listen to good music while you workout. The water bottle holders which also double as item holders allow you to keep water handy for hydration, while you can also keep items such as keys, a remote control, etc, in one of them. 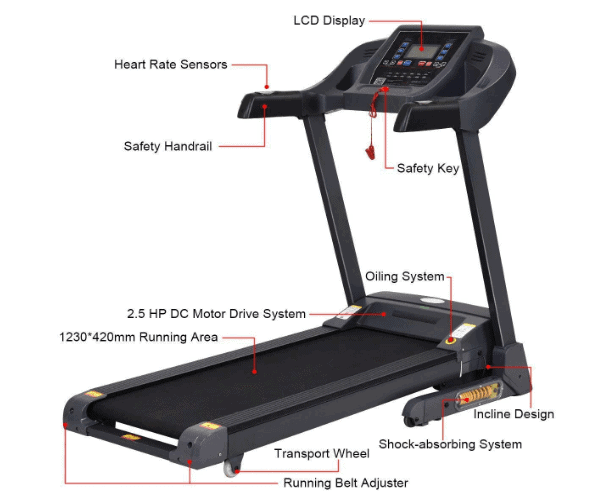 Vendors have different policies on shipping the Gymax Cardio Folding Exercise Electric Motorized Treadmill New Model. Some charge for shipping while some like Amazon provide free shipping and delivers within days of order. The assembly of this treadmill is pretty easy and it doesn’t take time to complete. It comes with the motor and the tread belt already assembled or attached to the frame. You only need to attach the console masts and the console to the core unit. The assembling tools for getting the job done and the instruction manual that walks you through the process of assembl are included in the package. Amazon also provides ‘’expert assembly’’ that offers to assemble the treadmill on your behalf at a charge when subscribed to it. The Gymax Treadmill New Model does not require any serious maintenance. 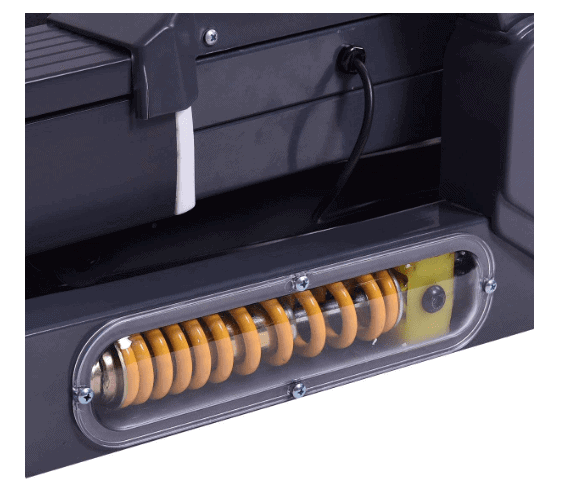 The manufacturer also makes it easy for you to lubricate the tread belt by providing the oiling system on the deck. Aside from that, you only need to keep the treadmill clean at all times and do not expose to water, rain or moisture as the motor or the console could be affected. The Gymax Cardio Folding Exercise Electric Motorized Treadmill New Model is an ideal treadmill for walking, jogging, and light running. It is suitable for everyone that wishes to keep up with good physical fitness. It also has several good features that help you realize your fitness goals such as the 12 programs, the Bluetooth connectivity and G-Fit app, and many more.